AnyMP4 Audio Converter for Mac 6.0.78 無料ダウンロード - Convert audio to any audio format; take audios from video files on Mac. AnyMP4 Audio Converter for Mac is the professional audio converter software, which enables you convert multiple audio to many other popular audio formats including FLAC, APE, MKA, AC3, MP2, M4A, MP3, ALAC, CAF, WAV, etc. with excellent quality. Besides, it can help you extract audios from the video files. Apart from that, this AnyMP4 Audio Converter for Mac allows you to trim the audio length for your needs, merge several audio clips together into one single file. And you can enjoy these audio files on many portable devices like iPod Nano 7, iPod Touch, iPad Mini, iPad 4, The new iPad, iPhone 5S/5C, Zune, PS3 and others. AnyMP4 Audio Converter for Mac can help you convert various audio formats to your needed audio format like MP3, M4A, MP2, AAC, AC3, AIFF, AMR, AU, APE, MKA, ALAC, FLAC, CAF, WAV and so forth on your Mac. Thus, you can enjoy them on your any portable devices like iPhone 5S/5C, iPhone 5, like iPod Nano 7, iPod Touch, iPad 4, iPad mini 2, The new iPad, Galaxy Note 3, Windows Phone 7, Nokia and so on. 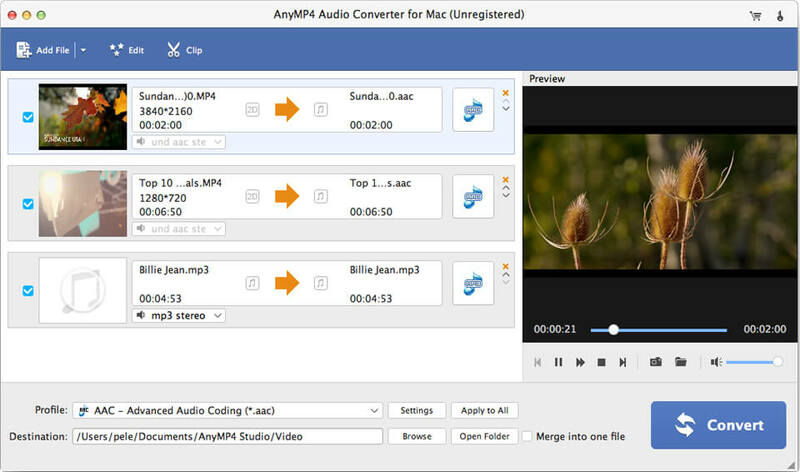 With this AnyMP4 Audio Converter for Mac, you are able to extract audios from the videos such as MP4, AVI, WMV, MKV, FLAV, VOB, TS, OGM, WTV and others. And then you can convert these audio files to your needed formats. This AnyMP4 Audio Converter for Mac provides you with wonderful editing functions, so you can trim the audio to your needed length by clicking "Trim" button; you can set the start time and the end time to define it. Also, you can use "Merge" function to merge more than one audio file into one single file according to your needs.